Efficient solution for supply and exhaust ventilation of enclosed spaces.EC fans with low energy consumption.Supply air cleaning is provided by the G4 and F7 filters. Additional air purification due to recirculation. H13 filter is available as an option.Upgradeable with an exhaust duct to provide air extraction from the bathroom.Easy installation.Compact size.Controlled by Android or iOS smartphone or tablet over Wi-Fi. 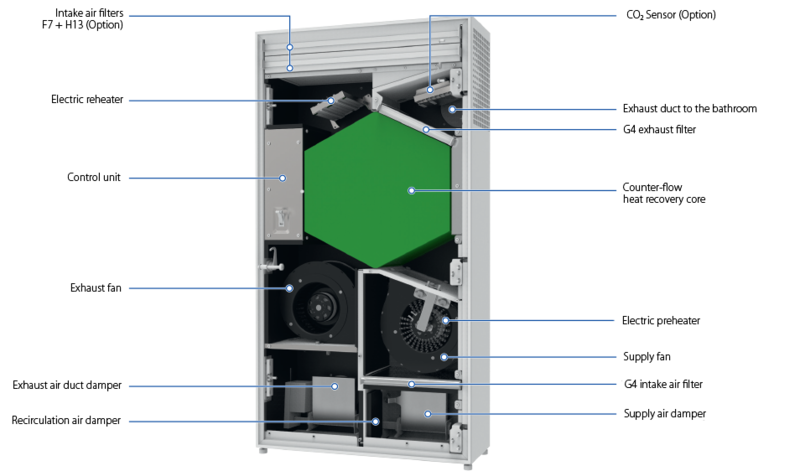 The casing is made of polymer coated steel plates.The front panel provides convenient access for filter maintenance and has a lock for extra security.The unit has two Ø 100 mm pipes for fresh air intake and stale air extraction outside. The third Ø 100 mm pipe (included in the scope of delivery) can be additionally fitted to the unit to connect the exhaust air duct from the bathroom.Available modifications with an integrated preheater and reheater for cold climate applications. The units feature efficient electronically commutated (EC) motors with an external rotor and impellers with forward curved blades. 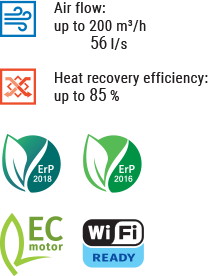 These stateofthe-art motors are the most advanced solution in energy efficiency today.EC motors are characterised with high performance and optimum control across the entire speed range. In addition to that the efficiency of electronically commutated motors reaches very impressive levels of up to 90 %. The cold outdoor air passes through the filters and the heat exchanger and then is delivered to the serviced space by the supply centrifugal fan. The supply and exhaust air dampers are closed, the recirculation damper is open The room air circulates through the filters. Then it is returned back to the room purified. Supply air cleaning is provided by the G4 and F7 filters. To meet more stringent air purity requirements the F7 filter can be replaced with an H13 Filter (purchased separately).Exhaust air is cleaned by the panel filter G4. PREHEATINGFreshbox E-200 ERV WiFi, Freshbox E2-200 ERV WiFi units are equipped with an electric pre-heater for freeze protection of the heat exchanger. REHEATINGFreshbox E1-200 ERV WiFi. 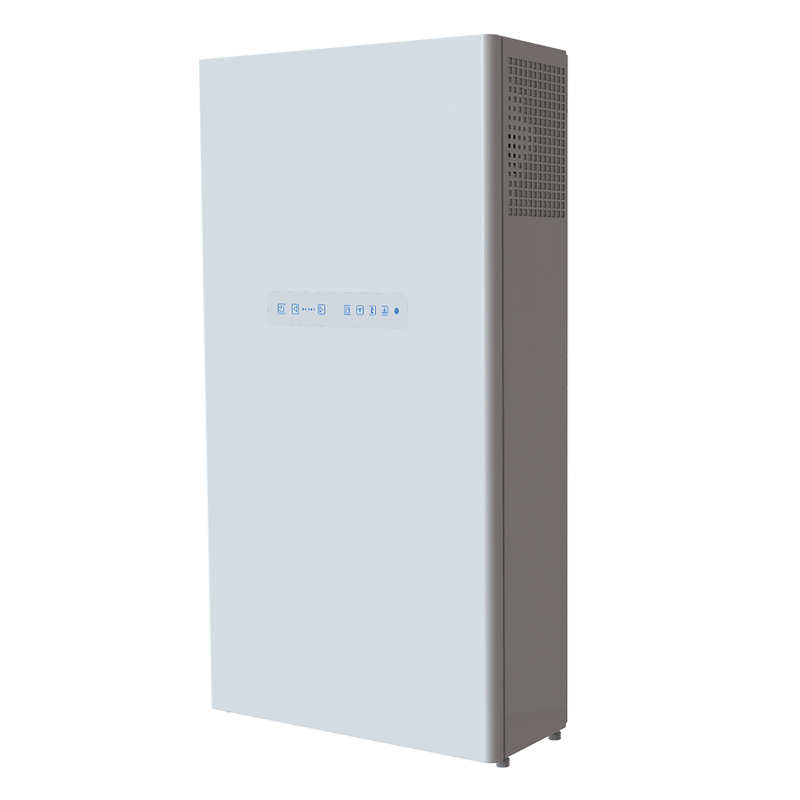 Freshbox E2-200 ERV WiFi units feature an electric reheater to raise the supply air temperature as necessary. The Freshbox 200 ERV WiFi features an exhaust air temperature sensor downstream of the heat exchanger which disables the supply fan to let the warm extract air warm up the heat exchanger. Then the supply fan is turned on and the unit reverts to normal operation. Freeze protection for Freshbox E-200 ERV WiFi and Freshbox E2-200 ERV WiFi is implemented with an electric preheater. The unit is equipped with a counter-flow energy recovery core with an enthalpy membrane at the core. 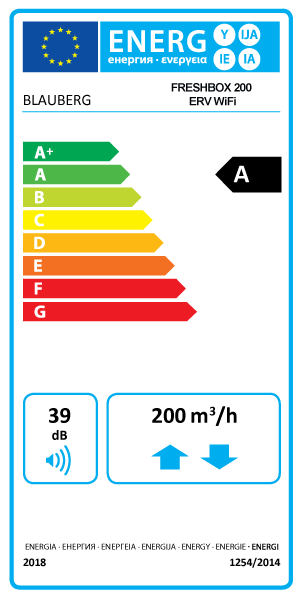 Each space requiring ventilation is equipped with one or several Freshbox 200 ERV WiFi units. Can be upgraded with a bathroom exhaust air duct. To enable such a configuration the units can be additionally equipped with the optional ø100 mm spigot (supplied as standard).